Welcome to the Daybreak Imagery Blog! Daybreaking News has graduated to blog status where we’ll be posting updates on what we’re photographing and what’s happening in our neck of the woods. Summer has come and gone, and it was another great season at the Daybreak Sanctuary. 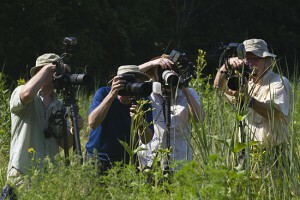 We hosted more than 100 photographers, naturalists, and nature-lovers who explored and photographed our birds, butterflies, dragonflies, and gardens. Others found frogs, sedges, grasses, wildflowers, and insects like praying mantids and grasshoppers at the wetlands and prairies. We enjoyed every visitor and are already planning improvements for next year’s workshops. We thank all the camera clubs who braved the heat and humidity in July and August to photograph butterflies and dragonflies here. If trees could talk, I’m sure our big old pecan tree would have many tales to tell of all it heard from the dozens of you who sought respite from the heat (and enjoyed ice cream) beneath its shade. For those of you who plan on returning next spring, please drop us an email or call to reserve your dates–most of our 2011 bird photography dates are already booked. This entry was posted on Tuesday, October 26th, 2010 at 3:54 pm	and is filed under Birds, Butterflies, Gardens, Photo Workshops, Seasons. You can follow any responses to this entry through the RSS 2.0 feed. Both comments and pings are currently closed.